Less than 100 days to Pluto closest approach, and counting. 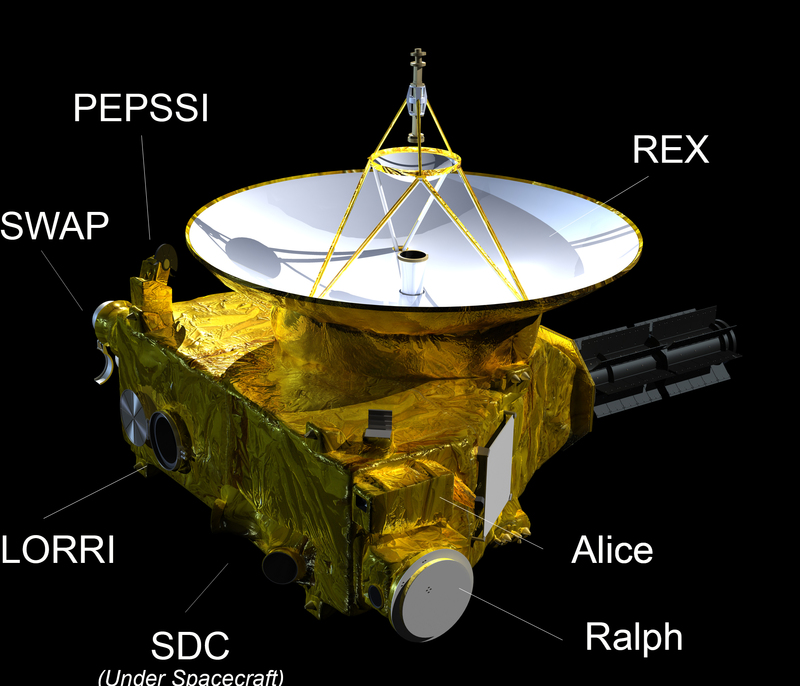 Get the scoop on the high-tech instruments that make up the New Horizons science payload. Speeding toward a historic flyby on July 14 – just over 98 days from now – NASA's New Horizons spacecraft has moved into the second phase of its approach to Pluto and its moons, beginning a series of observations and activities that will bring these distant, icy worlds into sharper focus than humankind has ever seen. New Horizons began its long-distance encounter phase with Pluto in January, taking dozens of images used primarily to navigate the spacecraft toward Pluto and using its plasma and energetic-particle sensors and dust detector to sample the environment and learn more about the Sun's influence – or space weather – near where Pluto orbits 3 billion miles from the Sun. During this first approach phase New Horizons also made an important course-correction homing maneuver on March 10. In the more intensive Approach Phase 2, which started April 5 and lasts through mid-June, the mission adds numerous new and significant observations of the Pluto system, including the first color and spectral observations of Pluto and its moons, and series of long-exposure images that will help the team spot additional moons or rings in the Pluto system. The spacecraft will also make its first ultraviolet observation to study the surface and atmosphere of Pluto and the surface of Pluto's largest moon, Charon, and the spacecraft will conduct a major joint test of flyby radio science observations in conjunction with NASA's Deep Space Network (DSN). These various activities are critical to developing a fuller picture of that system, and in assessing any hazards New Horizons could face as the spacecraft passes between Pluto and Charon. "The best images we have today still show Pluto and its moons as dots in the distance, but by the time AP2 ends in June, we'll see Pluto like never seen before," said Alan Stern, mission principal investigator from Southwest Research Institute, Boulder, Colorado. "This is the time when Pluto transforms from a planetary astronomer's world – spied only through telescopes with just the slightest detail – to a planetary science target of the most capable flyby spacecraft ever sent on a first reconnaissance mission." The New Horizons team will discuss the objectives and provide a detailed overview of the July Pluto encounter in a pair of hour-long, televised and webcast briefings from NASA Headquarters on April 14 at 1 p.m. EDT. Watch this site and www.nasa.gov/newhorizons for details. That spacecraft – operated from the Johns Hopkins University Applied Physics Laboratory (APL) in Laurel, Maryland – is healthy, operating normally and homing in on Pluto at more than 31,000 miles per hour. New Horizons is approximately 2.98 billion miles (4.79 billion kilometers) from Earth and just about 73 million miles (118 million kilometers) from Pluto itself. The team is evaluating new tracking data to decide whether they'll need to carry out a course correction on May 15; a decision is expected about May 1. Follow New Horizons on its path to Pluto. "As the year started, we said New Horizons was on Pluto's doorstep," said mission Project Manager Glen Fountain, of APL. "Now we're opening that door, getting closer and closer to our first real look at these mysterious worlds on the edge of the planetary frontier. This is pure exploration, and it's amazing to be a part of it."